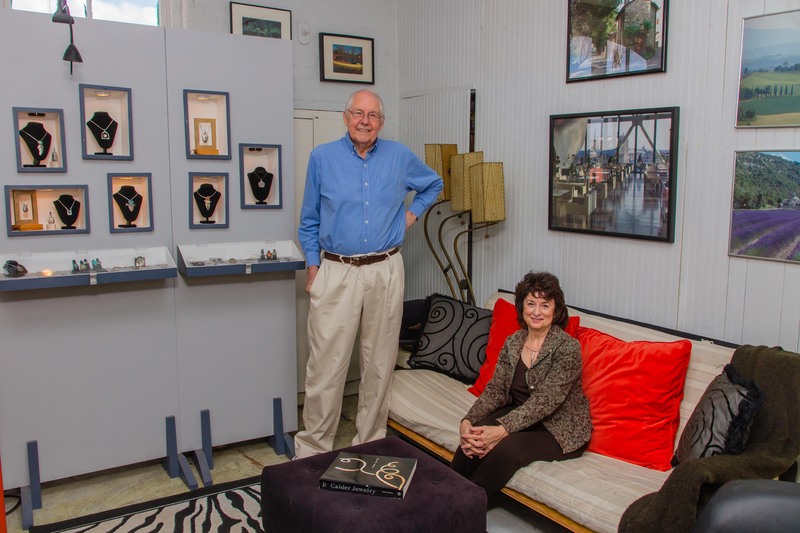 I visited the studio of Sandra Picciano-Brand and her husband David Brand recently because I needed two photos. I wanted to post each of these two jewelry artists as ARTIST OF THE WEEK on the facebook page Dayton at Work and Play. 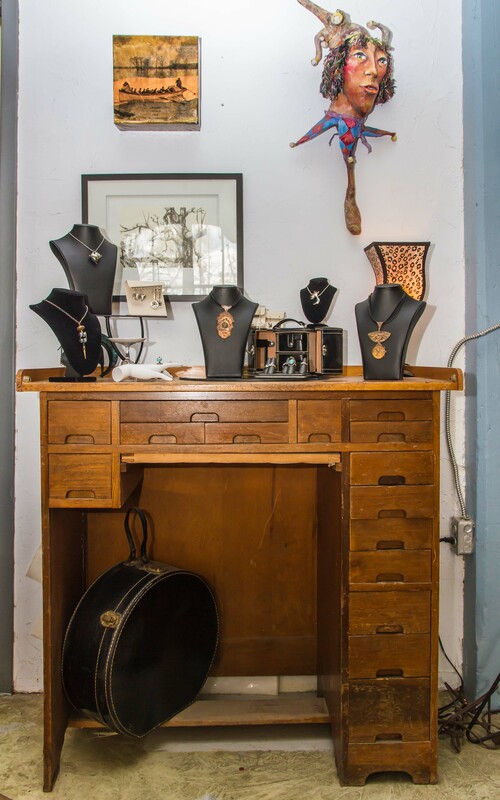 Sandra and David’s studio is located on Front Street in a building built in the 1850’s. Currently filled with artists, the building originally housed manufacturers. When a visitor climbs the stairs to the third floor studio he finds himself in an elegant sitting area. That sitting area also serves as a showroom for some of their jewelry. Sandra’s jewelry is known for its fluid form. 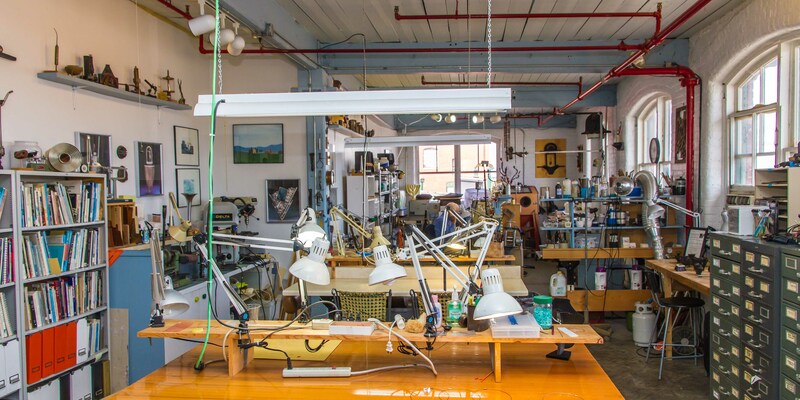 She grew up in the jewelry business, and the furniture in the studio includes her step-father’s workbench. Sandra moved into this building in 2000. When she married David 9 years ago they began the first of several expansions. They currently occupy a space of 1,800 square feet that is filled with natural light. David was an engineer before he started his art career, and you can see that influence in the precision of some of his pieces. 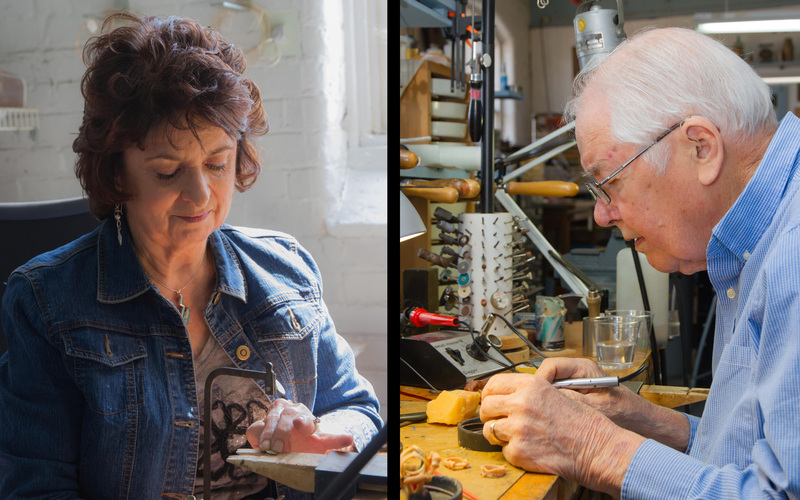 Sandra and David met as they were each teaching jewelry design at various locations around Dayton. The photo above shows one room where David and as many as 12 students work. Note the large library of art books available for inspiration. 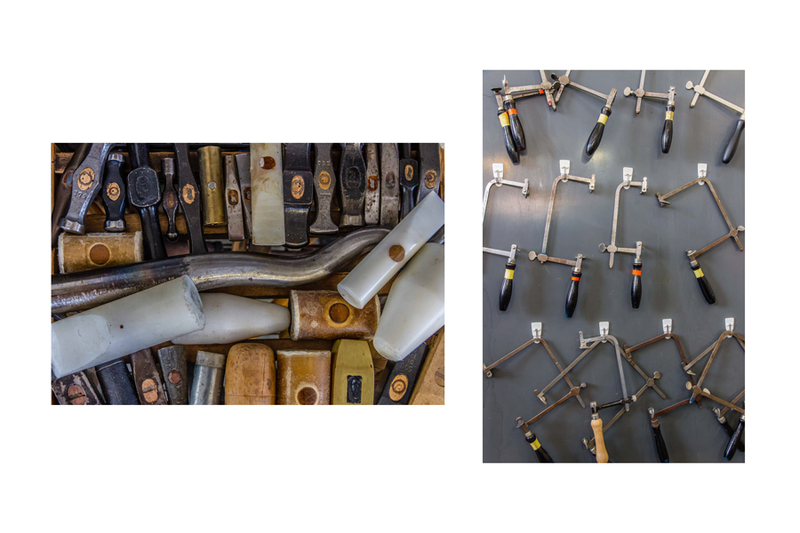 With two full time jewelry artists plus their students, the studio is filled with hammers, saws, pliers and grinding and polishing wheels of all kinds. 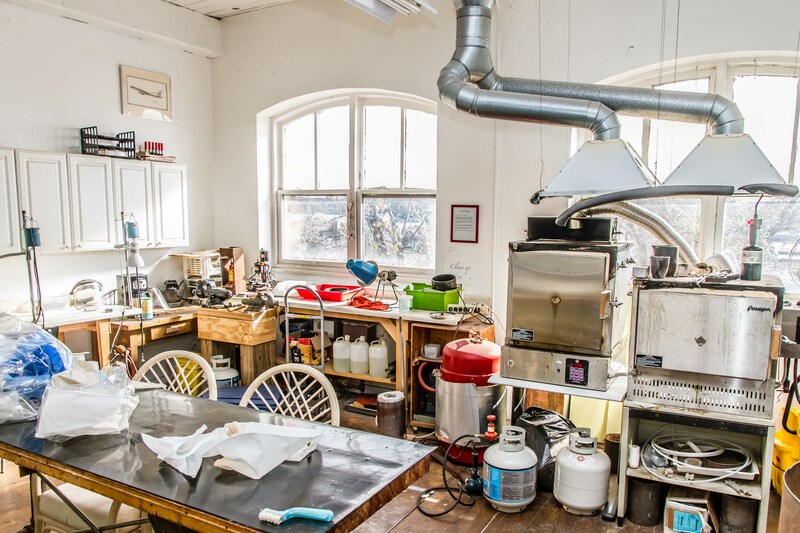 The casting room shown below has furnaces needed for making jewelry using the lost wax technique. Students create a design in wax, which is then embedded in plaster. 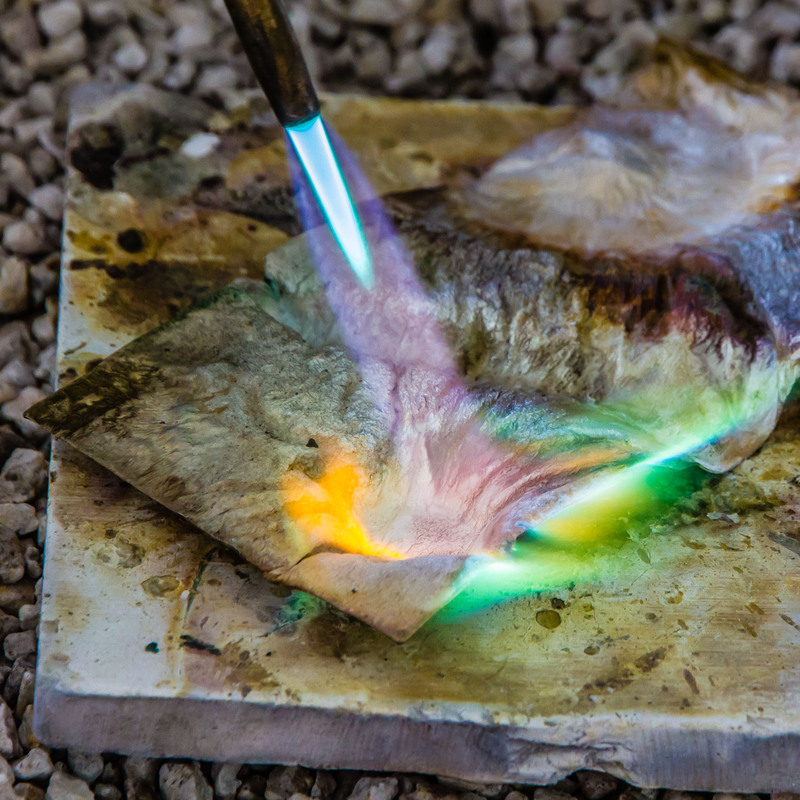 When the wax is melted away, there is a space inside the plaster into which metal is poured. 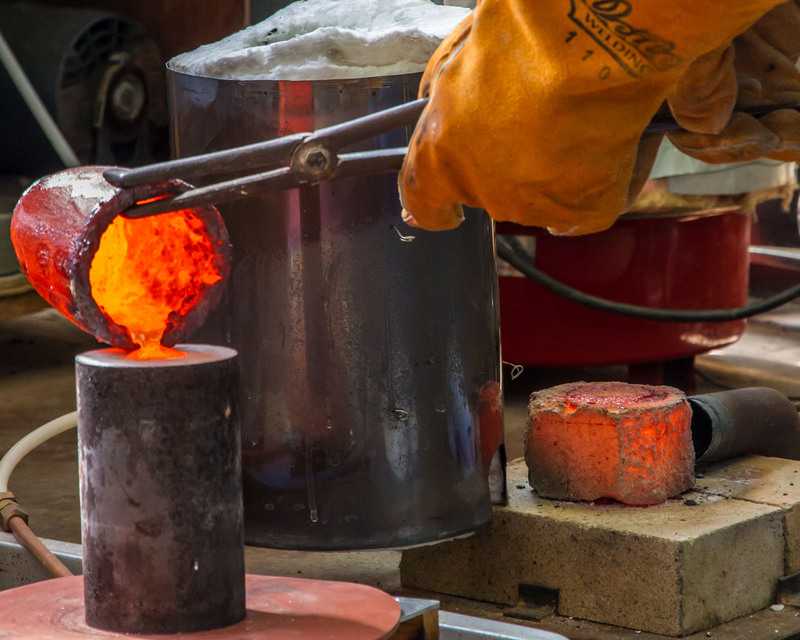 I visited the studio as David was helping students cast their pieces in bronze. That gave me the photo I needed for David’s posting as ARTIST OF THE WEEK. I showed the photo to Sandra, and explained that photographers love things like molten metal, steam, sparks and fire. Not to be outdone, Sandra showed me how she makes reticulated silver. She starts with a smooth sheet of silver, heats and cools it several times, then soaks it in a pickling solution. The magic happens when she heats that sheet with a torch. The surface gets ripples and ridges. Jewelry made from this material will have slight shadows that shift as the wearer moves. Very cool.